Dinosaur High Bouncing Balls! Beasts of bounce! 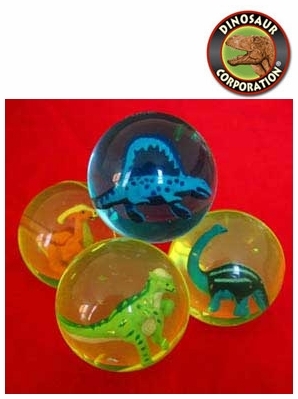 These hi-bounce balls measure 2 inches (5 cm) around and feature a variety of dinosaurs. Tyrannosaurus rex, Triceratops, Stegosaurus, Pterodactyl, Iguanodon, Plesiosaurus, Ankylosaurus, Brachiosaurus, Pachycephalosaurus, Parasaurolophus, Ceratosaurus, Apatosaurus.